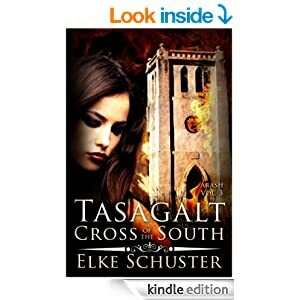 Tasagalt ,– Cross of the South, (Arash Vol. 3),Elke Schuster. I was excited to see this third book out – there’s only one more to come…So far I’ve loved this unusual fantasy trilogy about the Arash, a group of sort of immortal humans with special abilitites. No vampires, no werewolves, just Arash, and though I love the others its been great meeting a new type of fantasy character. So, after all the dramas at the end of the last book where is the story going next? I love the romance between Cassius and Liv, he was so determined in his pursuit of her, and they already been through a lot. So it was really sad to see poor Liv hurt so badly when Cassius gets infatuated by another girl….that was heartbreaking, and like the rest of the group I was shocked by it. Then there’s the search for Liv’s mum Rebecca. They’ve just found out she’s alive, kidnapped for the last 20 years by another Arash, and not dead as they’d thought. Now the search is on for her. Liv sister Sophie features a lot in this book, in the last book Liv was supposed to wipe her memories of the Arash but she didn’t, breaking Arash laws. It’s just as well though, as what she knows is very important to this book. Poor Liv in despair at Cassius’ behaviour, alienated from much of the Arash for the secrets she’s keeping, discarded once again she feels by her family, is very depressed. I can understand that – the others are puzzled at Cassius too, but can offer no explanation for his affection for someone else and dropping her….Only Sophie seems to remain steadfast to her she thinks. Of course everything is not as it seems on the surface, but this novel is really full of emotion from Liv POV, and I was so upset for her. Some of her actions seem a bit offkey to the others, but she can’t tell them her secrets, though she has their interests at heart always. She thinks they’ve discarded her, but she still loves them and will look out for their welfare, even if it means risking her own life again. It’s a really emotional read, and full of surprises. I hate when leads get superpowers right at the crucial moment, but Elke manages to overcome that by sliding in new essentnial talents as part of the story, of the characters growth and changes. Arash can gain new special abilities as they mature, so bringing them in prior to them being needed works well. Cassius, ah Cassius, what are you thinking??? Liv went through so much, what will happen with their romance, the one enduring constant that’s been the real hook to my love of this series? Lots of questions in this part, lots of answers too, but then more questions open up 🙂 Devious Elke, just Devious! And then that ending! What exactly has happened? My mind is puzzling it opnce again and I need the next book – now, ASAP please. Stars: fabulous read, full of drama, action and emotion. Five stars. Sometimes I just like a gentle, easy to read romance and I’d picked on this one yesterday. Well, its easy to read but a little to light for me. Harper was a good lead but…she’d worked hard to get where she was, and I thought she was naïve to think she could escape telling her employers and best friends that Meg’s brother was the father of her baby. To me she’s too intelligent to make such a silly mistake – still – she did and now Kevin is back in town for good, and she needs to tell him. She’s felt guilty all along about her secret and its not easy revealing it. Kevin took it badly, he was shocked, though as his mum reminds him it took two of them! He’s holding a grudge anyway about how Harper dropped him – but is still really attracted to her, which seems to annoy him at times. But is he ready to be a father, a family man? Lots of decisions on both sides, and they made some moves that I really didn’t understand, reacted differently to what I would expect knowing the character type presented. Still, it all works out with a sweet happy ending. Overall a fun, light read but not one to keep for me. 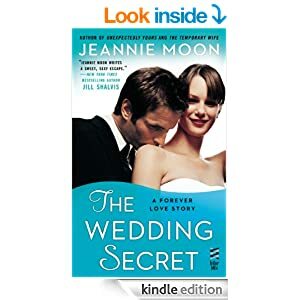 Still, its probably just what many readers love, romance, sweet story and a HEA. Not every one wants deep exciting drama of course! Stars: Three – its OK, a decent read but nothing heart-stopping.